Villa Sunset contains three spacious bedrooms, all with stunning natural toned vaulted ceilings, ceiling fans, air-conditioning, duvets and luxurious en-suite bathrooms laid with chic limestone and full body showers. Located on the west coast of Antigua. In Jolly Harbour is where you will find many fabulous restaurants, grocery shopping, pharmacy, banking, ice cream and coffee shops. 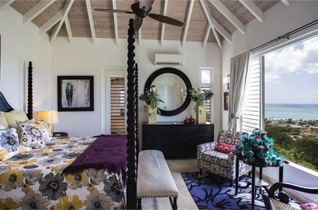 We are the highest rated Villa in Antigua. 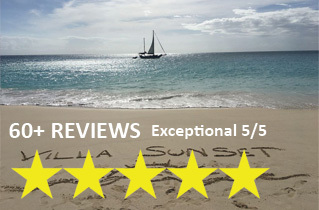 Read our reviews and find out what our guests enjoyed the most about our own piece of paradise. If you have any questions, please don't hesitate to contact us. Luxury Villa. Stunning Views. Private. The Best! Welcome to Villa Sunset in Antigua! 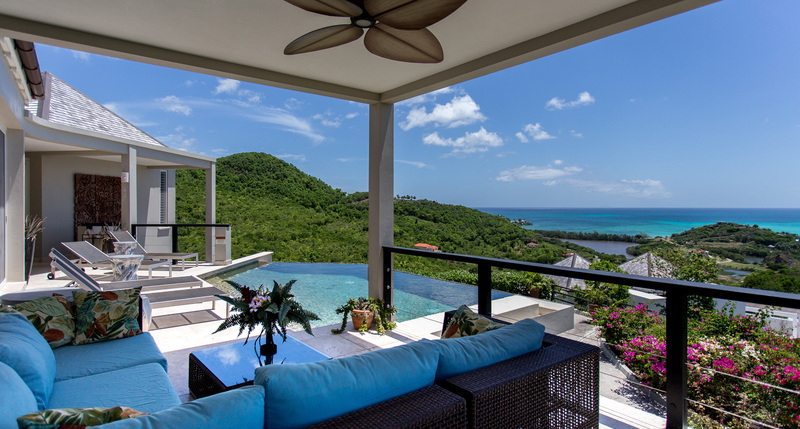 Enjoy this luxurious Caribbean style villa located on the west coast of Antigua. 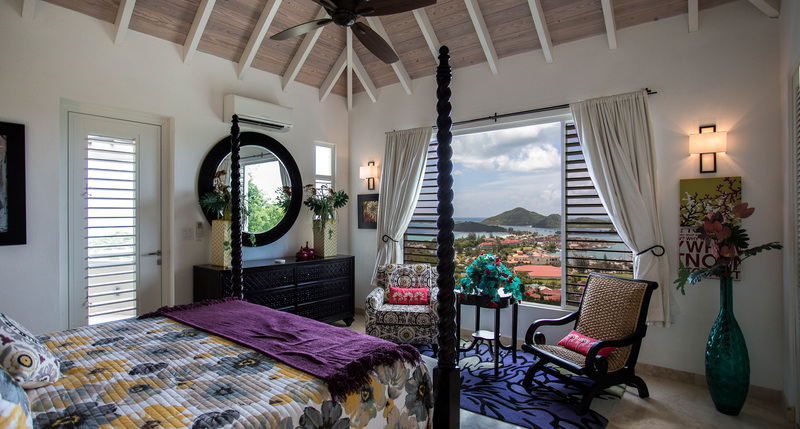 Villa Sunset sits atop a private lush hillside bordered with natural sugar cane overlooking palm lined white sand beaches, turquoise waters of the Caribbean Sea and the headlands to Five Islands Bay. 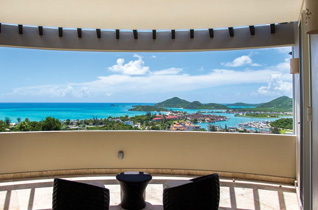 With its elevated location, feel the cool trade winds flow through the Villa as you enjoy the breathtaking panoramic views that stretch across Jolly Harbour and to the islands beyond: Montserrat, Nevis, St. Kitts, and Redonda sit on the horizon like jewels in the glistening sea. To the east lie the unspoiled forested hills and valleys of Antigua’s striking coastal highlands. Enjoy a cup of coffee by the sparkling infinity pool and take in the glorious views of the island below waking up and coming to life with each bright new day. The stone-finished pool is the centerpiece of Villa Sunset, which is surrounded by natural tones contrasted with rich dark woods, contemporary styles and Caribbean flair. Attention to detail and the tasteful designs embrace comfort and relaxation to ensure your vacation supersedes your expectations. The Villa boasts three equally spacious double bedrooms that have been decorated magnificently, each with spectacular views of the ocean. 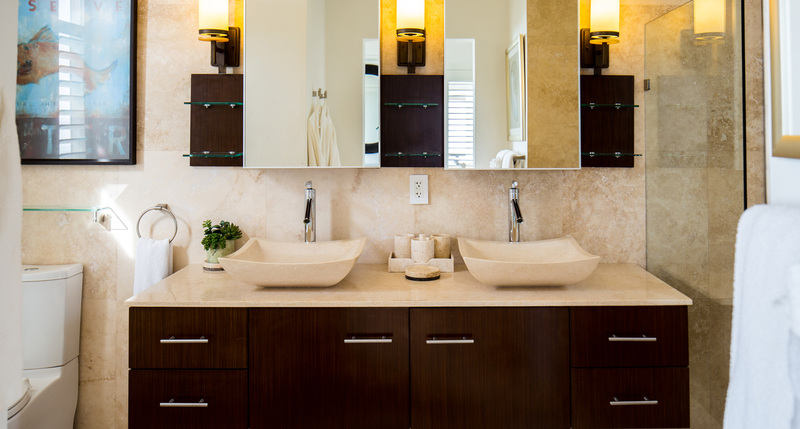 Each bedroom has their very own luxurious limestone en-suite double vanity bathroom with spa-like full body showers. The gorgeous airy and open living area is equipped with state of the art technology and amenities. The designer kitchen includes stainless steel appliances, granite counter tops, and a breakfast bar. The indoor living area leads out to the veranda, which offers comfortable shaded seating to take in the fabulous views or catch some Caribbean rays in any of the four sun loungers lining the refreshing infinity pool. 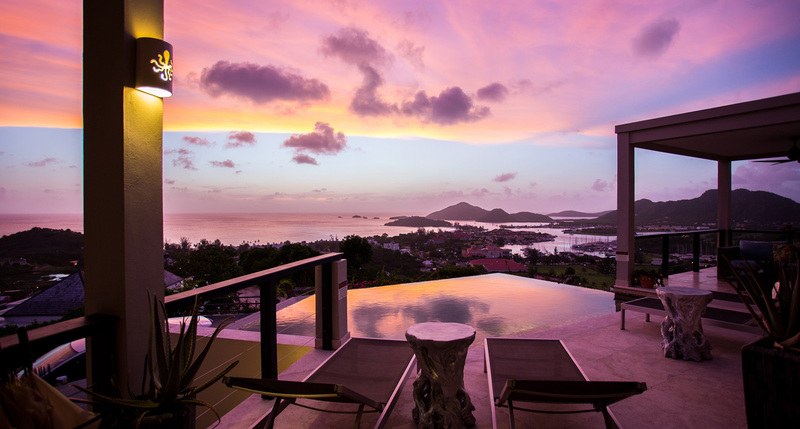 Either way, you will be in the perfect location to seize the famous Antiguan sunset at dusk! 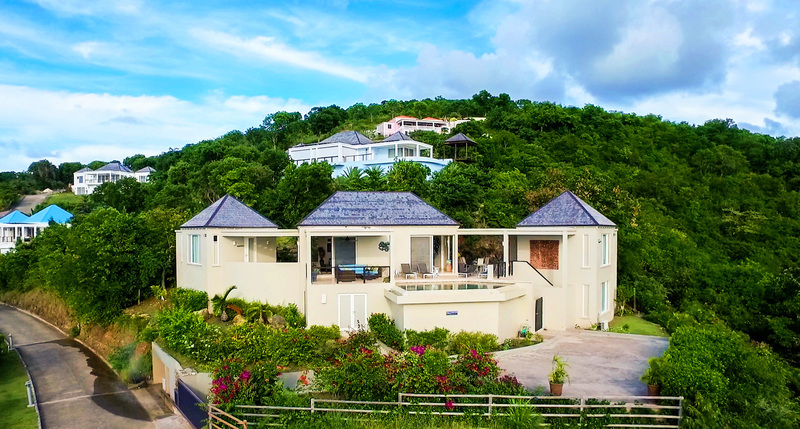 Book your getaway at Sunset Villa in Antigua and enjoy: Luxurious Villa, Fabulous Panoramic Views, Spectacular Sunsets, Infinity Pool, Jolly Harbour and all the amenities!